Q: Can you lose your hunting license if you vote in North Dakota? A: No. A partisan Facebook ad is referring to resident hunting licenses in other states being invalid once someone has North Dakota residency. The ad was paid for by the North Dakota Democratic-NPL, which is the name of that state’s Democratic Party, and it ran six times, according to information from Facebook’s “ad archive.” Some of the ads were seen by more than a thousand people in North Dakota before Facebook took down the ads for violating its advertising policies, according to the “ad archive” information. North Dakota Democratic-NPL website: By voting in North Dakota, you could forfeit your hunting licenses. You MUST be a resident of North Dakota to vote here. And if you are a resident of North Dakota, you may lose hunting licenses you have in other states. If you want to keep your out-of-state hunting licenses, you may not want to vote in North Dakota’s 2018 election. That much is true — in order to vote in North Dakota, you must show ID with proof of residency, and many states don’t allow you to have a resident hunting permit if you are not, in fact, a resident. But it’s not true that there is any direct link between casting a vote in North Dakota and forfeiting a hunting license in another state. We talked to an elections specialist in the North Dakota Secretary of State’s office, Lee Ann Oliver, and she told us that not only is there no mechanism by which her office would notify another state about a voter casting a ballot, there would be no way for her office to know what state a given voter had come from. In North Dakota, you don’t have to register to vote; you can just show up to the polls with an ID that proves you’re a resident in order to cast a ballot. So, there is nothing tied to your voting record that would indicate whether or not you had lived in another state or have a hunting license in another state. Since one common form of ID used to vote is a driver’s license, we also talked to a spokeswoman for the North Dakota Department of Transportation, Jamie Olson, who told us that when someone comes to North Dakota from another state, he or she has to hand over the out-of-state license and the DoT notifies that state that the license is no longer valid. The DoT does not contact any state agencies that would issue hunting licenses, though. So, voting will not jeopardize a hunting license. The issue is merely one of residency: Someone can’t have a resident hunting license if he or she is no longer a resident of that state. Facebook. Ad archive for the North Dakota Democratic-NPL. Accessed 5 Nov 2018. North Dakota Democratic-NPL. “By voting in North Dakota, you could forfeit your hunting licenses.” Demnpl.com. Accessed 5 Nov 2018. North Dakota Secretary of State. ID Required for Voting. Accessed 5 Nov 2018. Oliver, Lee Ann. Elections specialist, North Dakota Secretary of State’s office. Interview with FactCheck.org. 2 Nov 2018. Olson, Jamie. Spokeswoman, North Dakota Department of Transportation. Interview with FactCheck.org. 2 Nov 2018. 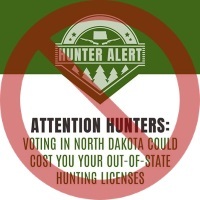 "By voting in North Dakota, you could forfeit your hunting licenses."